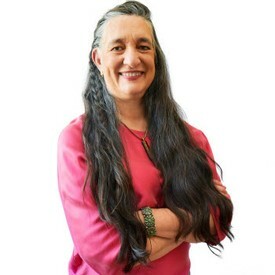 Dr. Hunter attended UC Berkeley, where she received a BA in Genetics. She received her DDS degree from Case Western Reserve University in Cleveland, Ohio. Upon her return to the Bay Area, she taught DAU on the clinic floor at UCSF Dental School, before settling into her private practice in Livermore, and motherhood. At first, she practiced dentistry in Livermore on a part time basis, in order to raise her sons. During their childhood, she was active volunteering for the local pre-schools and elementary schools, Little League, and Cub Scouts. Professionally, she has also volunteered for Expanding Your Horizons, and LCDC. She has always pursued continuing education classes avidly. From 1994 to 1996 she attended the UCSF Miniresidency in Orofacial Pain. In 1996, having passed the board exams of the American Board of Orofacial Pain, she became a Diplomate of the American Board of Orofacial Pain. She then went on to serve on the exam committee for that organization, helping to write questions for future board exams. She continues to attend both high level general dentistry classes and orofacial pain meetings throughout the country. Now that her sons are grown, she has turned her full attention to providing high quality dental care and the treatment of orofacial pain to the Livermore community. In her new, state-of-the-art facility she is able to practice full time, including Saturday hours. 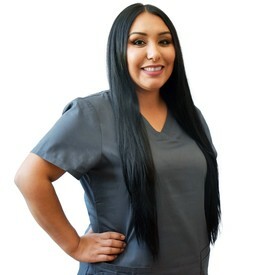 Marina has been with us since 2015 and has an Associate of Science Degree in Dental Assisting. She likes to think of herself as a versatile dental assistant. You will find her at the front desk answering insurance questions, scheduling appointments, and going over treatment plans. She also maintains the back office and provides chairside assistance for Dr. Hunter. Marina will tell you the most rewarding part about being a dental assistant is helping others. She also enjoys working as a team with Dr. Hunter to help patients smile with confidence. When she is not here in the office, you can find Marina spending time with her family and exploring the Bay Area.